Finally, there is a more efficient method of attaching insulation to duct work. After years of extensive research in the field, J.T. Products has developed Zip-Ez™, the lightening-quick flex and duct wrap fasteners that save HVAC companies time, money and labor, and prevent that unnecessary requirement for call-backs. Unlike past methods of attachment, such as tie-wire or tape, Zip-Ez™ unique, patented design is mechanically secured, allowing for a permanent installation that will never need repair or adjustment. While tape and tie-wire loosen and deteriorate over time and when exposed to extreme temperatures and conditions, Zip-Ez™ is constructed of a modern, durable material that resists even the harshest environments and is sure to last as long as the duct work itself. An added benefit can be found in both the ease and speed with which it is installed. The Zip-Ez™ utilizes a standard, quarter-inch hex head screw, enabling a quick, simple, one-handed installation via a drill screw. This method not only far surpasses the efficiency of previous ones, but also provides a uniformity in the installation that allows for a neater and more professional overall appearance. J.T. Products is so confident in their new Zip-Ez™ fasteners, they even offer a money back guarantee if the contractor is not completely satisfied. Information on the Zip-Ez™ fasteners can be obtained by writing J.T. Products, Inc. at P.O. Box 626, Warwick, New York 10990: or call 845-988-2000 or fax 845-988-2001. Warwick, NY – February 8, 2008 – The revolutionary Zip-Ez™ fastener for duct and flex wrap took the recent New York AHR Expo by storm. A steady stream of contractors, distributors and engineers watched attentively as manufacturer J.T. Product representatives showed how Zip-Ez™ fasteners are the fastest, easiest way to permanently attach duct wrap and flex. No more bloody fingers and bludgeoned hands from those self-cut pieces of metal or stick pins that just don’t stick. Zip-Ez™ are so easy to use! Just one per foot is all you need – its really quite that simple. Zip-Ez™ fasteners have gained wide acceptance with commercial and residential installers looking for a permanent fastener that can also save on labor costs. The Johns Manville insulation display also featured the Zip-Ez fasteners at the world’s largest HVAC&R exhibition at the Javits Center in New York City, proving Zip-Ez’s ever-increasing acceptance and popularity. Zip-Ez™ are available nationally and internationally at wholesalers nationwide. Join the thousands of satisfied customers using Zip-Ez™ fasteners. For more info or to watch the install video, please visit www.jtproducts.com. Warwick, NY – J.T. Products Zip-Ez™ the revolutionary fastener for H.V.A.C. insulation has been GreenSpec Listed and will be featured in BuildingGreen Inc.’s GreenSpec Directory. The GreenSpec Directory lists environmentally preferable products with an objective to list only the top 5-10% environmentally preferable products. We’re proud to announce that BuildingGreen found Zip-Ez™ fasteners to be an energy-saving system of attaching insulation to ducts and that using Zip-Ez™ fasteners may add LEED points towards “green” building certification. 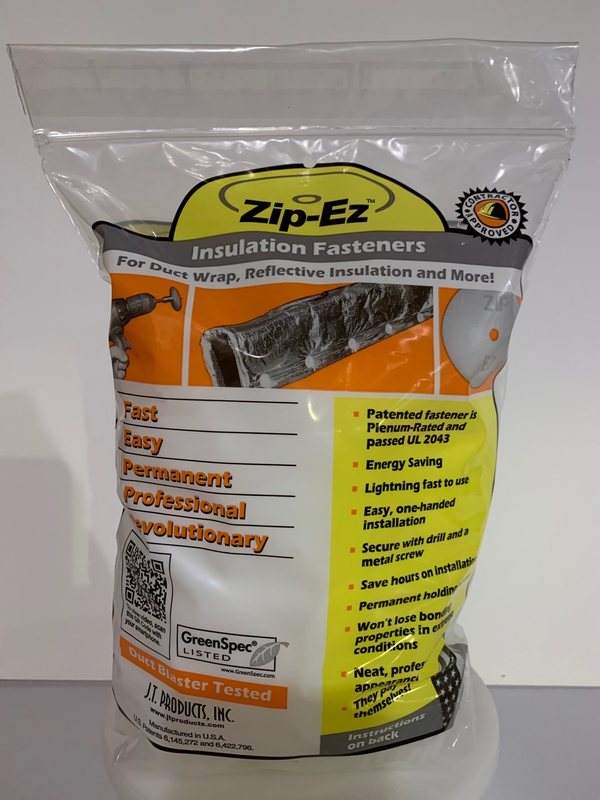 UL Classified and now GreenSpec Listed Zip-Ez™ fasteners are the preferred, patented insulation fastening system that saves time and also helps save energy. They are manufactured in the US can be found in all of the top wholesale locations across the country. For a complete listing, check our website location listing at http://www.jtproducts.com/product-locator. Warwick, NY, J.T. Products Zip-Ez™ the revolutionary fastener for H.V.A.C. insulation has passed and exceeded the National Duct Blaster Test. The test concluded that “No measured or visible leakage was observed before or after installation of the Zip-Ez fasteners. To view or download a PDF of the test results, click here. To view a video showing the National Duct Blaster Test, click here.